Shame and “La Nación” Newspaper. BRIEF INTRODUCTION. In response to the latest report on hydroelectric dams on the Santa Cruz River published by this Observatory, the newspaper La Nación has gone back to criticizing, as is their monotonous and long-standing practice. We are referring to their editorial on Saturday, 2 January entitled “Two shameful dams”, that argues: “The hydroelectric project on the Santa Cruz River should be revised, since it contains too many negatives and environmental hazards.” The text is extraordinary however you look at it, given that it encapsulates the central dispute that has been playing itself out since 1810: A sovereign, self-sufficient, industrial, federal and socially fair nation, or an underdeveloped and subordinate Argentina. The political forces that represent the second option are driven and defended by domestic neoliberals and foreign allies, in an unfortunate degradation of society (in the 19th century, members of the Argentine establishment were British merchants, bankers and industrialists; during much of the 20th century they were both British and Americans, but industrialists and financiers; up until the emergence of the Chicago Boys hand-in-hand with the Pinochet and Videla genocides and, with them, financial terrorism and western corporatism). We must always remember that a subordinate Argentina is impossible without foreign support. The newspaper La Nación’s attacks on our non-traditional allies – The People’s Republic of China – whose investments do not subjugate us to their industrial, commercial, financial and geopolitical interests, form part of a larger strategy that came from the West and tries to exploit fledgling neoliberalism in South America. The Sino-Argentine partnership, built over these twelve years must either end, or adapt to a new policy of looting. “Two shameful dams” reads the headline of the pro-government newspaper. But this newspaper is not in moral or ethical conditions to be able to speak of “shame”. Does La Nación newspaper feel shame about the dams? 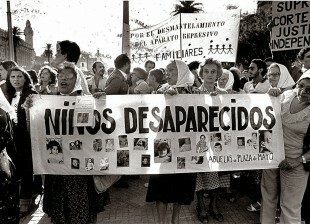 We are the ones that feel ashamed when we see that their pages still vindicate the genocide against the sister Republic of Paraguay; Argentine people feel shame about their support to each and every one of the coups d’état that took place in our country and in the region; shame, yes, but about the scams of foreign debt, of the tax contributions debt it has with its employees, about the Argentine manufacturer of newsprint Papel Prensa and other negotiations that afflicted us with hunger, poverty and de-industrialization, in which this newspaper was complicit; shame, yes, but about the support and concealment of crimes against humanity between 1976 and 1983. Go back to using fans? A former Bolivian President who represented the Santa Cruz city oligarchy said, in 1930-1931, that he believed his country’s hydrocarbons were his (they exported them while the people did not have enough power even to a light bulb): “We are a poor country and we must live poorly.” Luckily Evo Morales did not follow suit. Actually we are not poor countries but rich countries that have been deliberately impoverished. Argentina’s oligarchy and its foreign partners would have us believe the same thing: we live in midst of a crisis; we must live frugally (as in a war economy). Our oil and our energy are not enough; consumption should drop exponentially, until we reach a surplus balance (exports exceeding imports). It is the famous issue of self-sufficiency but with industries, provinces and people left on the outskirts. To sum up, “going back to using fans” is intended to make us believe that we live in a poor country; it is to instill the idea that air conditioning is for the rich and for the shareholders of ministerial status that head business associations (Ministry of Energy, as they call it). The people should go back to using fans, while the President of the Nation’s business partners continue to manufacture and market air conditioners galore. Why do they talk about an energy crisis? Because they want to instill in us the idea that energy is a privilege and not a right. The rejection of the Santa Cruz dams means reversing the trend recorded since 2003 of harnessing the national hydroelectric potential (estimated at 45.000MW; today we have 11,108 plants installed). Hydropower is the most widely used renewable source in the world and the one that has grown the most. It is a cheap, clean and renewable energy, with enormous socioeconomic benefits. It has been key to infrastructure in times of economic crisis and, due to its low cost for electricity generation, is instrumental in launching world industrial powers such as the US, Canada and Germany, among others. In our case and linked to the Santa Cruz River dams, it involves a substitution of imported fuels of around 1.1 billion dollars a year, with the added benefit of energy affordability. And this point is strategic, because the energy is not there to generate a surplus in the balance of trade nor to line the pockets or fill the stomachs of private shareholders. What is energy for, then? And even more importantly: Who is it for? Energy for what and for whom, that is the question that the Argentine people who do not want to go back to using fans should start asking. To this end, here are some definitions for the reader, which were systematically censored by the neoliberal media and its army of lobbyists. These definitions, as well as the study of the real indicators that measure the energy security of a nation, are being developed by the OETEC´s Energy Security Laboratory. But the more decisive definitions and actions in terms of transforming energy into an instrument for achieving “economic development” and in the context of “increased productivity and human welfare” belong to this last decade. The source initiative based on existing UN programmes on energy and entitled “Sustainable Energy for All” was reflected in the document “Energy for Sustainable Development in the Asia and the Pacific Region: Challenges and lessons from UNDP projects”. It was a revealing study published in 2004 by Asian UNDP experts. Among the definitions included, we highlight: 1) “Energy affects virtually every aspect of economic and social development, including livelihoods, water, agriculture, population, health, education, job creation and gender issues. Energy, therefore, is central to all the Millennium Development Goals (MDGs). The basic idea of UNDP´s energy approach focuses on the creation of equitable access to clean, reliable and affordable energy to contribute significantly to economic growth and poverty reduction”, and 2) ”Energy is important for providing basic services to human needs; and is also key for sustainable development and for all efforts to reduce poverty. Therefore, the role of energy is strongly linked to social, economic and environmental development.” More disclosures…. In line with UNIDO, the overall objective of UNDP in the energy field is to “achieve universal access to affordable, clean and modern energy to achieve sustainable human development, with a clear focus on the most vulnerable sectors.” In other words, and under UNDP concepts, “to improve the sustainability, security and accessibility of modern energy” since it “facilitates social and economic development, providing opportunities for the improvement of standards of living and economic progress”. We challenge the reader to find at least one word of any of these definitions among the hundreds of articles and opinions related to the energy sector that the newspapers La Nación, Clarin, Peril, etc. print annually. So, returning to the Argentine case, the same year that UNDP proposed restoring energy – disposed in neoliberalism- Nestor Kirchner launched (May 2004), with the same spirit and objectives, the National Energy Plan. This plan, the most ambitious in the history of national energy, made it possible to complete energy projects for over 24.4 billion dollars, propping up an economy that expanded by 90% in the last twelve years. They incorporated 12,250 MW and more than 5,800 kilometres of power lines (2,058 kilometers in Patagonia, Sir Columnist!) that allowed them ring the national energy grid. Over these 10 years the energy demand in Argentina has almost doubled. The aforementioned projects led to the incorporation of new users, throughout the length and breadth of the country, to services that they previously had no access to: Since 2003, nearly 4,600,000 households and 320,000 new industrial and commercial electricity meters were added to the grid, while over 2,300,000 households were connected to gas networks as well as 120,000 new industrial and commercial premises. There is no doubt that there is still much to be done. But the inheritance was grim and dated back half a century. In this regard, we believe that hydropower is crucial to further expanding universal energy, energy as a tool for development and progressive quality of life for 42 million people and 23 provinces, without exclusions of any kind. And if on this path we import more fuel and export less or nothing, so be it. Similarly if Edenor and Edesur must borrow to invest what they did not invest (hence we recovered the FOCEDE), so be it too. We prefer a balance sheet in deficit, and indebted shareholders for a time -after decades of hard graft and investing practically nothing – than fans for everyone. Energy crisis? It all depends on the cultural understanding you have of energy. Half-truths are half-lies: Kirchner and Cepernic dams… Ranked 23 and 25? Does the reader notice anything strange? The date, perhaps? Yes, you guessed it. The report cited by La Nación, as if it were from today or yesterday, will actually be a decade old this year. Of course, the newspaper does not mention this. Second question. On delving into the report and seeking the disastrous ranking, a subtle trap is observed that we bring to light. The study evaluates different hydroelectric dams based on the measurement and comparison of technical, environmental and economic variables. Among the three variables, we find the “Hierarchy of multicriteria feasibility”, a category that is statistically more valid. The newspaper La Nación, in making this mistake, showed they do have the faintest idea or the least bit of common sense, and chose the economic variable arbitrarily. There is where they get the rankings of 23 and 25 from. What would have happened if I used the multicriteria feasibility variable? Of the 30 projects, the report pre-selected 20, and of those 20, it selected 12. Well, Condor Cliff ranks 8 and La Barrancosa ranks 11, but with the following exception: if we add the megawatts of the first seven (see table) together we have nearly the same amount of power as Condor Cliff alone. Not to mention if we add La Barrancosa (750MW). Source: Expedited review of hydroelectric plants. November 2006. P. 15. Argentine Ministry of Energy Emprendimientos Energéticos Binacionales S.A. (EBISA). In other words, of the 12 plants such as those with the highest multicriteria feasibility (without counting the analysis of whether the plant belongs to one or many provinces, which affects the jurisdiction of the river): 6 do not exceed 250 MW; 2 do not exceed 500 MW, while the remaining include the current Nestor Kirchner and Jorge Cepernic plants under construction (2,150 MW limited by the bidding to 1,740 MW); Chihuido I (850 MW – later limited to 690 MW) awarded to date, and Michihuao (621 MW – not tendered). Furthermore, it is worth noting that to obtain equal annual power and generation, including several of the other “priority” projects, would entail a much higher economic cost and management cost. And finally, a magnificent piece of information. When the dates of the source studies on which this work was conducted are observed, it appears that those related to Condor Cliff and La Barrancosa are the oldest. When do they date back to, the reader logically wants to know? They are from… 1977! If there was something that Martinez de Hoz did not intend to do, was to forge relations with China. What do we mean by this? That the lack of financing and the current final project totally invalidate this ranking that is almost three decades old. And, as icing on the cake, as La Nación criticized for no reason that the projects would work only for 26% of the total hours in a year, it should be known that the last and definitive study of the Universidad de La Plata estimated the percentage to be 34%. To sum up, La Nación newspaper based it information on a report that was a decade old, in turn supported by an economic analysis of potential hydroelectric plants that, for the specific case of the Santa Cruz River, referred to reports drafted thirty years ago. Further down the line, we will see the current economic analysis, that is to say, of 2015, the 21st century, ignored by La Nación and its inexplicable preference for prehistoric analysis. And then they hurry us along with 30-year-long projects! To us of all people, when we completed Yacyretá and Atucha II! The Ministry of Energy is still looking into the fact that the La Nación newspaper forgot to quote and reveal the importance that the national government gave to the dams on the Santa Cruz River. We understand that, once certain resolutions of the Ministry of Energy of 2009 and 2011 had been reviewed, the newspaper La Nación had no other option than to turn to prehistoric times to discredit and distort it all. We refer to Resolution 762/2009 of November 2009 issued by the Ministry of Energy through which the National Programme of Hydroelectric Projects was created-, and Resolution 932/2011 or the National Programme for Hydroelectric Power Projects, a norm issued on 13 September 2011, also by the same Ministry. What is the importance of both? In the preamble to the final resolution we read: “That in the year 2006, the Energy Secretariat of the Federal Ministry of Planning, Public Investment and Services, through EMPRENDIMIENTOS ENERGETICOS BINACIONALES SOCIEDAD ANONIMA (EBISA) conducted an expeditious review of hydroelectric power plants with the purpose of ranking the thirty (30) existing hydroelectric projects based on feasibility criteria taking into account technical, environmental and economic aspects. 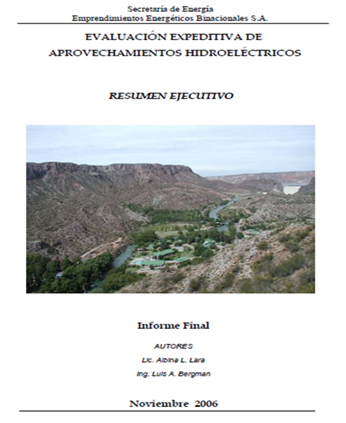 In its short-term proposal EMPRENDIMIENTOS ENERGETICOS BINACIONALES SOCIEDAD ANONIMA (EBISA) defined the need to reassess the necessary studies in the shortest possible timeframe to proceed with the construction of three (3) hydroelectric plants, which have arisen from a selection that prioritized those projects: that a) have a strong impact on the Wholesale Electricity Market (MEM) due to the energy and power they bring, b) are developed on waterways in Argentine territory and c) allow building more than one works per province, enabling their implementation through agreements to be signed with the provinces in whose jurisdiction these were located. Through the application of such criteria the following have been considered relevant: the Hydroelectric Compound CONDOR CLIFF — LA BARRANCOSA, on the SANTA CRUZ River, to generate ONE THOUSAND SEVEN HUNDRED AND FORTY MEGAWATTS (1740 MW), in the Province of SANTA CRUZ; the Multipurpose dams LOS BLANCOS I and II, on the River TUNUYÁN, of FOUR HUNDRED AND EIGHTY-FIVE MEGAWATTS (485 MW), in the province of MENDOZA; and the Multipurpose dams CHIHUIDO I, on the NEUQUEN River, to generate SIX HUNDRED AND THIRTY-SEVEN MEGATWATTS (637 MW), in the Province of NEUQUEN”. happened that La Nación newspaper got so confused? Believing that the world ended in 2006. But EBISA stayed in the game … In its post-2006 assessment recommendations, it made proposals for action in the short, medium and long term, taking into account progress already made and the energy policy planning that promoted social development and was provincially inclusive, focusing on the human factor instead of favouring the energy balance of trade and the infeasibility of the non- Pampa provinces. This is how Condor Cliff and La Barrancosa climbed in the rankings, given that the new and highly positive economic feasibility took into account not only the historic expansion of the national grid, but also the fact that they were closer to meeting the demanding financing requirements inherent in undertakings of this size. The new study ended up by positioning the Jorge Cepernic and Nestor Kirchner hydroelectric dams first and foremost. Investment to transport energy from the dams? But what radars and telecommunications satellites are they tuning to? IAE is run by the person who was one of President Raul Alfonsin’s Energy Ministers. We are talking about Jorge Lapeña, an engineer. 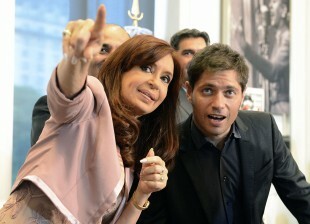 In the book “Nestor and Cristina Kirchner. Planning and federalism in action” (book prefaced by President Cristina) and written in conjunction with Federico Bernal, we dedicated several pages to analyzing the terrible management of the former official. We will say, however, that the energy crisis of 1988 – the worst I remember in our history, even more serious than those of 1999/2000 and 2002 – not only showed how terrible energy planning was at the time, but also the disastrous state of the thermal power stations that did not manage to make up for the decrease in hydropower generation. It was headed by Lapeña himself, who prior to leading the Ministry of Energy (April 1986 to March 1988) was Under-secretary of Energy Planning (1983-1986). But let’s allow President Alfonsin himself to be responsible for evaluating the IAE Director’s performance: “The deficit of companies under the Ministry of Works and Utilities accounts for half of our country’s fiscal deficit and it is there that we see the inefficiency of the state, perceived and suffered by society in the services provided by these companies. Weak gas supply, power cuts and other deficiencies are known to all and are manifestations of the critical situation of our government-run utilities.” (Original source: “State, public administration and public policies in presidential speeches in Argentina (1983-2011)” by Jorge O. Bercholc and Diego J. Bercholc). Source: Taken from the official website of IAE. Such a level of confusion in their reports and dates, ranging from the 70s, through to 2006 and 2010, leads us to believe that La Nación editorial writer does not use Argentine radars or satellites to orient himself in space and time (and to think we have actually built them). Unfortunately, this is another of the disgraceful consequences of never looking away from the North. Santa Cruz, the country’s second largest province, just 700km away from Malvinas, cannot generate power? 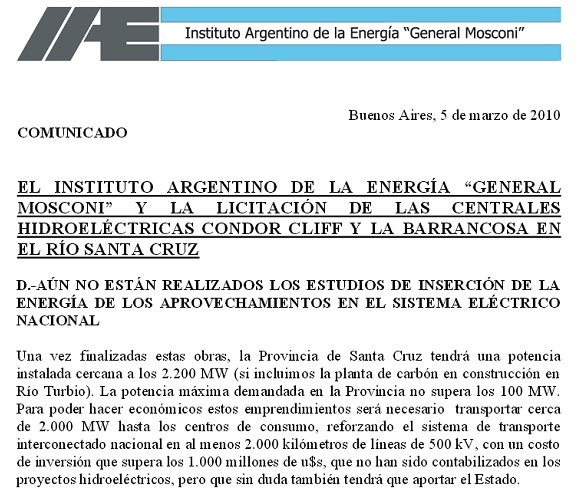 Let’s focus on this phrase: “The Argentine Institute of Energy General Mosconi (IAE) said that, if projects were carried out, Santa Cruz would have a generating capacity 20 times higher than demand …”. Neoliberalism has always been keen on causing the country to ‘sink’. First it was through civil wars and appropriating control of Customs and foreign trade; then it was through free trade imposed by Bartolome Mitre, then in the twentieth century, it was the IMF´s adjustment plans, conservative decentralization, domestic and foreign debt, nationalization of debt thanks to Cavallo and Melconian, the zero deficit of Sturzenegger and Cavallo, all seeking to sideline provinces and municipalities; now, the Macri administration will try to drown the country with a new wave of decentralization, coupled with the indiscriminate lifting of restrictions on imports, the incorporation of the country into the Pacific Alliance and US geopolitics, with new debt payments to the vultures, auctioning of Vaca Muerta and the elimination of the Federal Solidarity Soybeans Fund, among other measures. And it is for this reason that any work or investment that tends to build the objective conditions for generating genuine economic and social development will be fought to death. The thing is that it is this law, the Law on Irrigation and not the law on spillage, which is the law that presides over the true development of nations like ours. Investments that allow irrigation in abundance and cheap energy, in infrastructure projects that generate employment, industries, businesses, towns, roads, etc. are precisely those that precede the demand to create the conditions for this to appear, thus putting into motion the virtuous circle of development through irrigation. Conversely, we have the law on spillage, adopted by La Nación newspaper. Under this approach, Santa Cruz cannot have a demand exceeding supply, since it is an unproductive, unnecessary expense. Such an approach is not naive, but rather smart, since the most neglected regions and provinces -not useful to the world’s breadbasket- should continue in the same vein until the end of humanity. To paraphrase the Bolivian President: They are poor; let them remain poor! None of this dam business or cheap and abundant energy is for Santa Cruz! For Santa Cruz, penguins, sheep and archaeological ruins! For Santa Cruz, fans in the summer and firewood in winter, the energy must be saved once again for Methanex and all foreign buyers that tempt us! La Nación newspaper expresses culturally, politically and ideologically the historic project of a dependent, impoverished and backward Argentina. Certainly, a project that not because it is neoliberal means it does not plan or build infrastructure. In effect, it does plan and build, more in a sense of progress that is not that of La Nación, the 23 provinces and the 42 million. It plans and builds, as in the example of the Centenario, to extract our resources and export them without the slightest added value. Conversely, any infrastructure project unrelated to this colonialist exploitation is described as superfluous and unproductive spending. Nestor Kirchner in his historic speech of 25 May 2003 referred to it masterfully. 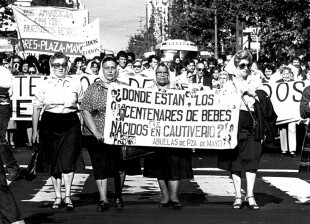 “We reproduce it verbatim: “We have to go back to planning and implementing public projects in Argentina, in order to refute through actions the only neoliberalism discourse that stigmatized them as unproductive public expenditure. We are not inventing anything new, the United States in the thirties overcame the deepest economic and financial crisis of the century in that way. Intensive housing construction, construction of road and rail infrastructure, better and modern hospitals, education and security infrastructure, will shape a productive country in terms of its food industry, tourism, energy, mining, new technologies, transportation, and will create genuine jobs.” Again and again, Kirchner would refute those stupidities with each new inaugurated project; President Cristina will continue to do the same. I also remember Nestor Kirchner´s speech towards the end of 2007, regarding the revival of the projects in Atucha II that had been paralyzed by former secretaries of the group led by Daniel Montamat at the time, the vast majority of whom are advisers to or officials of the current Ministry of Energy: “When we decided to launch these works again, some people said it represented unproductive public spending. I thank God for having remained faithful to my convictions and believing in production, in work, in national industry and in nuclear power as a driver of development”. These beliefs did not leave the country, as they think and as Mitre, Magnetto, the Rural Society and vultures would like to think. These beliefs represent half of the country that did not vote for the return of neoliberalism; these beliefs are inextricably embedded in every brick, every bag of cement, in the Argentine aluminium, science and technology, in the parts, machinery and engineering projects of the over 70,000 constructed projects over the last twelve years, in hundreds of new projects we have left, amongst those tendered, planned and underway. Another aspect to highlight is neoliberalism´s eternal criticism of projects of “great size” (”monumental projects,” according to the silliness created for this case and that we have discussed with Federico Bernal in our quoted book). Why this rejection of the great projects? Because these large-scale projects are those that are truly worthy of an Argentina of over 3 million square kilometres and 42 million citizens. And, fundamentally, because these projects usually extend beyond the boundaries of the long-awaited “Republic of the River Plate”. La Nación newspaper knows very well what we mean. This was the title of an article published on 9 December 1856 in the newspaper El Nacional whose author, Bartolome Mitre, openly suggested the definitive separation of the State of Buenos Aires and its organization as a nation. British intelligence, with their rifles and pounds, made him see more clearly that better than splitting was to exterminate the native country. It’s that Britain did not want to lose out on the extraordinary market of the del Plata Basin! Finally and like any great project planned according to a nation and its 42 million souls, the dams in Santa Cruz are an awful nightmare for Buenos Aires centralists. The price of energy. What is the cheapest? La Nación newspaper argued in its editorial of 2 January 2016: “To persist in the project [of the dams] will give immediate benefits to consultants, financiers and builders, but will hurt taxpayers and those who have to pay higher electricity rates. This should not be tolerated … “. The diversification of the matrix through hydropower must never, neither here nor in China, cause an increase in the cost of electricity. Indeed, the Nestor Kirchner and Jorge Cepernic dams will generate energy at an operational and maintenance cost of 6.01 US $ / MWh, once the loan is paid. For example, Salto Grande provides the cheapest energy of the Argentine electricity system: 4 U $ D / MWh. Cheaper energy promotes industrialization, which means more water and sanitation projects, more urban infrastructure, more education, science and technology, etc. Just for comparison purposes, the wind farms are in the order of 18 US $ / MWh, while solar energy actually exceeds 25 US $ / MWh. There is no cheaper renewable energy in the country and on planet earth than hydropower. To this we must add that their life cycles are vastly different: 20 years for a wind or solar generator, while for dams it can exceed 80 or more years. In fact, in Argentina there are dams that were built in the 30s and continue to be fully operational to date. If we add to this analysis the fact that the electricity generated from wind and solar sources cannot be stored, meaning their availability at times of peak demand cannot be guaranteed, nor can they meet basic demand (let alone to mention their low efficiency conversion rates), hydropower assumes even greater importance. To conclude, an important piece of information: In the summer, when there is greater availability of gas, Argentina exports energy to Brazil through the network connecting the two countries. This energy swap is only possible because our dams can be used as large storage units of natural gas. Emboldened by the greens heading the Ministry for the Environment, the newspaper La Nación would have us believe that wind and solar power are cheaper than hydraulic energy. We need only look at what is happening in Germany with its green program, known as the Energiewende, launched in 2010, although at least partially implemented since 2000. Why ask Germany?, more than one reader may wonder. It is simple. Because the German green “revolution” is the model for medieval environmentalist fundamentalism in China and in Argentina. Let’s look at some censored data on the rate-related benefits of wind and solar renewable energy. The list of scientific research studies that bear witness to an exponential increase in electricity prices for German households and the sustained increase in energy poverty in the country is endless. We will focus on three on account of their importance. Another interesting study was conducted by the renowned Helmholtz Centre for Environmental Research, in February 2015, and was entitled “Energiewende im Wunderland”. The authors conclude that electrical energy costs are extremely high and, therefore, have an impact on the most vulnerable households. They claim that, through energy, a redistribution of welfare from the poorest to the richest sectors is being witnessed (remember the request by the newspaper Clarin to go back to fans). The third report we wish to cite comes from the German Association of Energy and Water Industries (BDEW, for its acronym in German). Here it is stated that from the implementation of the Energiewende and up to 2013, German households suffered an increase in electricity prices of around 24%, primarily due to the increase in subsidies to finance the fund earmarked for the Energiewende. The same report notes that German electricity prices are the second highest in Europe after those of Denmark. In 2014, prices remained stable for the first time in 15 years, though varying by 1 euro of the 84 euros per month for a moderate consumption by a family of three. However, as a result of the impoverishment of the most vulnerable sectors, the consultancy Verivox warned in April last year that Germans must now work 70 hours a year to pay for electricity in contrast to 53 hours in 2005. This graph illustrates the increase in rates brought about by the “green revolution”. 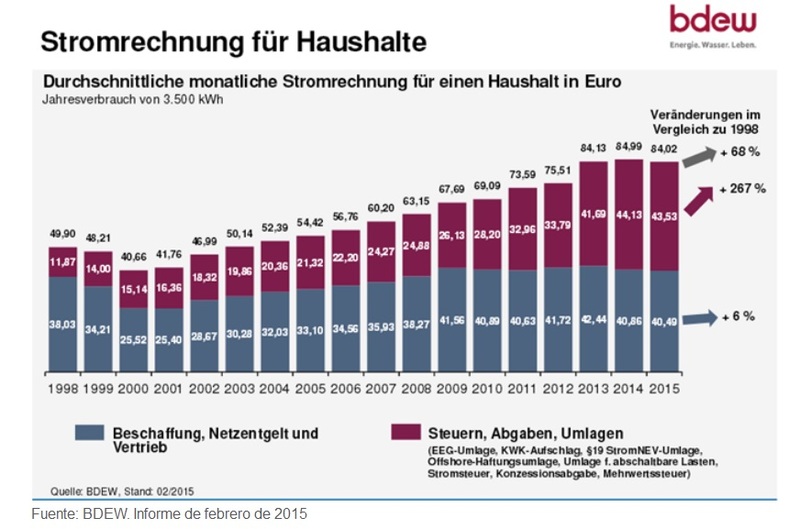 The burgundy colour includes subsidies to the Energiewende, which, as can be seen, have risen by 267% since 2000. 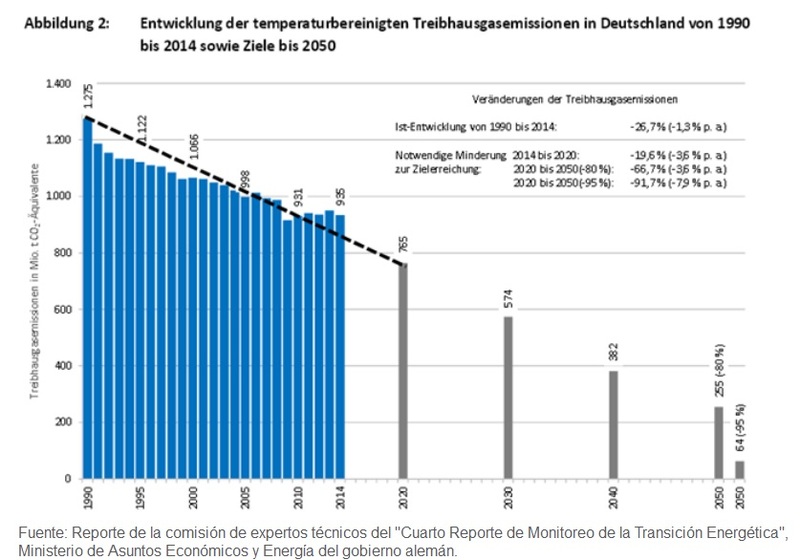 Source: Report by the Committee of Technical Experts of the “Fourth Energy Transition Monitoring Report”, German Ministry of Economic Affairs and Energy. In conclusion, wind and solar power cannot replace basic energy sources such as nuclear, hydro and fossil fuels. Their implementation also requires multi–million dollar subsidies with a consequent rise in electricity rates. But that is in Germany, which has technology and whose energy consumption does not need to steadily increase as it is already an industrialized nation, unlike Argentina, which still needs to greatly develop its productive forces and continue incorporating its population into gas and electricity networks. Can the reader imagine an Argentine version of the Energiewende, as proposed to us by the Ministry for the Environment and the newspaper La Nación? Besides, didn’t they want to eliminate energy subsidies? Green neoliberalism should know that a serious and responsible energy policy entails replacing fossil fuels with nuclear energy and renewable hydropower. Sanitation projects? Not for us! So “… sewage services, housing and education” are “priority and neglected” areas? To avoid overwhelming the reader, let’s just look at sewage services. In March 2006, the national government created AySA in order to continue, improve and expand the essential services providing drinking water and sewage systems to the population of Buenos Aires and the first ring of suburbs, based on the premises of social inclusion and the preservation of environmental resources. Thus, through AySA and all the projects carried out in the rest of the country, the State began to again play an active role in the provision of these essential services by creating 9 million new beneficiaries through expansion in water supply and sewer networks. This investment translates into improvements in health, with a notable reduction of 29% in child mortality in particular. In the period from 2006–2015, the total investment made in AySA was of 26.71 billion pesos, resulting in 727 completed projects and 8 million beneficiaries. Given that in 2003 the number of inhabitants provided with access to drinking water was 6,935,516, by 2015 that number had risen by over 34% to reach a population of 9,293,760 beneficiaries. Meanwhile, if the population with access to sewer services came to just 5,136,755 in 2003, by 2015 that figure had increased by more than 40% to reach 7,207,546 beneficiaries. The progress is indisputable and what we have reversed, is not the abandonment resulting from the infamous quarter century from 1976 to 2003, but rather from almost fifty years during which the people were ignored. To bring this issue to a close and to talk in terms of investments, we would like to refresh the memory of the newspaper La Nación. In the last twelve years, sanitation projects totalling around 107,825,000 dollars have been implemented, including power plants, gas and electricity pipelines, housing, roads, sewerage and water projects, etc. Where did the dollars end up during times of planning for Argentine debt? Ask the IMF and the Sociedad Rural. How much did neoliberalism “invest” in infrastructure and what was it spent on? Let’s see. In the 1984–2014 series of Public Works (INDEC), we can see that between 1984 and 1989 1–1.6 billion a year was invested in public projects. Although peaks of 2.2–2.5 billion were recorded, in the 1990s the amounts remained virtually the same as those for the administration of President Alfonsin. Between 1984 and 2002, total spending on public projects did not exceed 25 billion. That is to say that when compared to the investment of the past twelve years, it was 3.6 times less. The newspaper La Nación in its editorial of 2 January 2016 said: “It is worth recalling certain aspects that cannot be ignored in this discussion. For the construction of dams, three calls for bids were made, and between the first, held in 2007, and the last held in 2012, the cost increased four times. 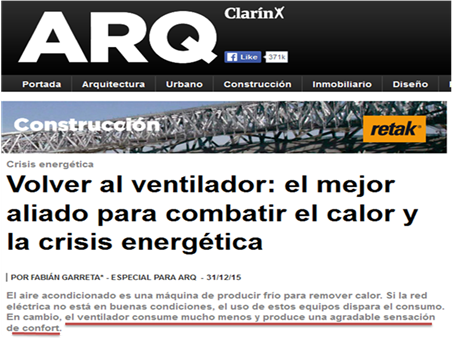 Amid great controversy, the construction was awarded to Gezhouba Group (China), Electroingeniería and Hidrocuyo. Gezhouba Group is the company that took part in the construction of the Three Gorges Dam in China, the largest in the world to date, known for the disastrous environmental consequences that it produced in the Yangtze River”. Back to front. The argument about the environmental consequences of the Three Gorges on the Yangtze River is unsustainable however you look at it. First, if you measure the environmental impact of that dam, you must also measure the environmental consequences of air pollution in China produced by power plants that run on natural gas and coal. And let’s add another variable that must be taken into even greater account when analyzing the human and environmental impacts among energy sources: mortality according to type of energy (to be precise, the number of deaths per TWh generated). We challenge the editorial writer to find a scientific study by WHO, the Chinese government, or if they prefer, OECD, that concludes that hydropower is more polluting and more deadly than fossil fuels. With regard to the calls for bids. The projects for the construction of the President Nestor Kirchner and Governor Jorge Cepernic dams were awarded in August 2013 to the joint venture formed by Gezhouba (China), Hidrocuyo and Electroingeniería (both Argentine). Why this call for bids? 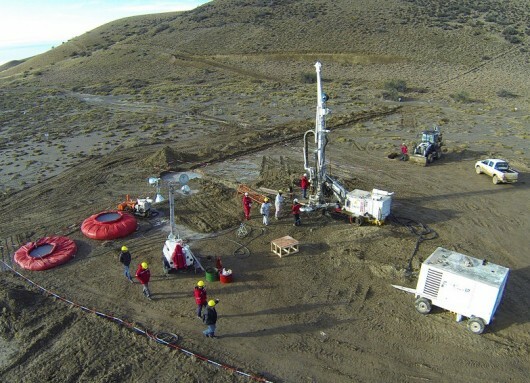 Because in 2010, the consortium made up of the companies IMPSA (Argentina), Corporación America (Argentina) and Camargo Correa (Brazil) did not obtain the financing the project required. After a nearly two-year extension, the national and provincial governments (Santa Cruz) closed the first bidding process. In August 2012, a new call for bids was initiated. Six months later, there were 5 offers with the participation of 21 companies (14 Argentine, 2 Brazilian, 2 Chinese, 1 French, 1 Korean and 1 Spanish). The pre-selection process took place in June of the same year (2013) with 4 bids being chosen, and the aforementioned joint venture was awarded the contract in August 2013. We should add that, thanks to the funding (U $ S 4.7 billion) contributed by three Chinese banks – CDB, ICBC and Bank of China – 77% of the 4,7 billion dollars will come into the BCRA during the construction phase. How will this funding be paid for? Out of the very power the dams will generate and sell to CAMMESA. This was an advantage that proved impossible for the competing bidders to match. La Nación said in its editorial of 2 January 2016: “As for Electroingeniería, it is a company that began building electronic boards in the 1980s only to end up participating in large–scale projects during the Kirchner administration, such as Atucha II”. It is not for us to defend Electroingeniería. However, we cannot fail to mention one key aspect related to this company that was omitted by Mitre: in an interview carried out by the newspaper El Cronista on 25 March 2015 the president of the company, Osvaldo Acosta, acknowledged that “.. .the best decade [for Electroingeniería] was from 1990 to 2000. In the Menem era we grew 70 times.” But during the nineties Electroingeniería was not a target of attack by La Nación. On the Petrobras operetta, I repeat: we prevented the backbone of the energy system from falling into the hands of a vulture fund with uncertain residence and no experience. I do not regret that the State has recovered a strategic asset such as the transport of energy, thereby benefiting all Argentines. I do not know Jorge Luz and Fernando Baiano, I have never seen them in my life and I do not know what practices they might have undertaken. I do know that thanks to the political decision of Nestor Kirchner, we were able to defend the national interest and avoid foreign ownership of Transener. I take this opportunity to remind the newspaper La Nación, which is concerned about this alleged scandal, that Techint was repeatedly denounced and involved in the “petrolao” scandal (bribes and Petrobras contractors ), as a service provider, and supplier of equipment and materials. But this newspaper has never written editorials on the Italian–Argentine Techint group, much less on its owner Paolo Rocca. Santa Cruz and Patagonia want to be something other than wind! How many hectares does 1,740MW in wind power need? This paragraph is a veritable litany of misinformation and ignorance. First, the morning newspaper should know that Patagonia is much more than a land of wind. This demeaning conception of all those compatriots living south of the Colorado River reminds us of the unusual basis for the so–called Belgrano Plan, which is worthwhile reviewing: “When we think about what it means to be Argentine we often think of landscapes from the north, songs that come from the north, memories that come from the north. The north has given and continues to give a great deal to Argentina. What has Argentina given it in return? Not much. A lot less than the north and its people deserve”. Argentina and the north (of Argentina) are two separate entities, reduced to nature and songbooks. When putting it all together, it is clear that for Macrism, the north of Argentina is landscapes, songs and memories, while the south is wind. Oscar Aguad, democratic and federal telecommunications minister summed it up much better: “The centre of the country voted in favour of Mauricio Macri, and the rest voted for the Peronists. 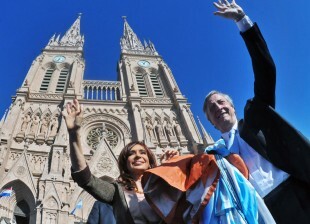 The centre of Argentina is the country that produces, the north and south live off cronyism”. He forgot to say that the barren landscapes of the north and the incessant and annoying wind of the south are to blame for the barbarism beyond the pampas being given to selling its dignity for a vote, a mattress or choripán (kind of Argentine sausage). Second, notice how the newspaper La Nación submits to the policy issued by the Ministry for the Environment of putting at the heart of the fight against global warming the development of wind and solar energies rather than nuclear and hydro. We have seen in the report by the OETEC -referred to at the beginning- that the main departments of that ministry include former directors of Greenpeace and other green fundamentalist NGOs, all of them declared rabid anti–nuclear and anti–dam activists. Freezing the Nuclear Plan (re-launched in 2006) and halting the National Program for Hydroelectric Power Projects (created in 2009) will be much more achievable using traditional medieval–environmentalist arguments. What about Fukushima, what about Chernobyl, what about the land under water, what about the land of the wind, etc. Lastly, and as was mentioned in the subtitle, the installation of 1,740 MW in wind power –which is what the medieval environmentalism at the head of the Ministry for the Environment is aiming for – would entail a wind farm of over 2,000 turbines. This represents an occupied area of 200,000 hectares, an area larger than the one that will be used for the dam reservoirs. This, of course, due to its utilization factor of 0.4. Still, given the random nature of the resource, there would not be sufficient guarantee of generation, or of active power reserve for the system, in addition to the drawbacks in the frequency regulation capacity. It is striking then that when speaking about wind and solar energy as a substitute for dams they do not take into account the “land flooding” factor. We might also add that the availability of more energy in the area – thanks to the transmission lines installed, which we mentioned earlier –will enable the development of the metallurgical, gas, fishing and oil industries, among others. The tourism sector will take advantage of the reservoirs that will be created in both dams for practicing water sports and tourist ventures. It will add a new destination for visitors to the area and therefore strengthen the regional economies. Tens of thousands of hectares will be made available for crops. Far from harming anyone, using the Santa Cruz River will, thanks to the existing electrical interconnection, will benefit Argentine society as a whole. Flooded lands, who do they belong to and how much was paid for them? In its editorial of 2 January 2016, La Nación newspaper stated: “From a territorial standpoint, the dams would flood the land on both sides of the Santa Cruz River, in the area of the farms previously and intentionally bought by a pro-Kirchner pseudo businessman, Lázaro Báez, because he knew beforehand which would be the area to be expropriated. In 2010, it was known that the hydropower compound would be built on 182,000 hectares owned by corporations belonging to the alleged front man of the Kirchner family”. We submit to the consideration of La Nación readers the “Report on Expropriation Lawsuits: President Dr. Néstor Carlos Kirchner and Governor Jorge Cepernic dams”, Rio Gallegos, 22 December 2015. We hereunder transcribe what all readers of this newspaper should know, and that the chief editor has omitted or ignored. On 2 January 2016, La Nación newspaper said in its editorial: “From the environmental standpoint, it must be recalled that the building of the dams can bring about environmental damages to the Santa Cruz River, its ecosystem, and particularly to the Perito Moreno and Upsala glaciers, which are a part of the National Glaciers Park, declared Heritage of Humanity by UNESCO. Nonetheless, despite the potential damages that such a significant project could generate, and without having fulfilled the prior environmental impact assessment, initiation of the works was hurried in mid-2015”. Let’s look into all this now. What do they mean that the prior environmental impact assessment was not fulfilled? We quote verbatim the paragraph of the OETEC Observatory report, a participant in the 9 December hearing, which in its minutes decided to approve the works’ Environmental Impact Study: “Within the framework of sections 5 and 8, Provincial Law 2,658 on Environmental Impact Assessments, and pursuant to the provisions set forth by the Environment Under-secretariat, Santa Cruz Province, on 9 December, a public hearing was held to address the building of the above-mentioned dams. Why hold a public hearing? It is an essential instrument of environmental policy based on citizen participation, so as to submit to their consideration the environmental impact study presented by the parties involved in the construction works and management of the resulting energy works. The hearing was held from 11 a.m. to 7:10 p.m. In a full room (with a capacity to seat 250 people) around 61 presentations were made, plus the questions posed and opinions provided by the audience, which totaled approximately 100 interventions. Strangely enough, no NGO opposed to the works on the Santa Cruz River, and particularly one called Banco de Bosques (Forest Bank), attended this participatory forum that had been so strongly requested by them on social networks and on their own web sites; they seemingly wish to legitimize actions carried out by their organizations and not the activities proposed by laws and provincial governments. The hearing addressed environmental issues, as well as topics related to fauna and glacier protection, and the level of decoupling of the dams from Lago Argentino lake, expropriation matters, particularly regarding the 200-metre river bank line, as presented by the indigenous peoples’ representatives; benefits of hydro power vis-à-vis other kinds of energy using fossil fuels. There was important consensus of practically all sectors on the overall benefits of these works for the Province, always highlighting and coinciding on the need for the works to be carried out respecting all applicable rules, particularly environmental ones. 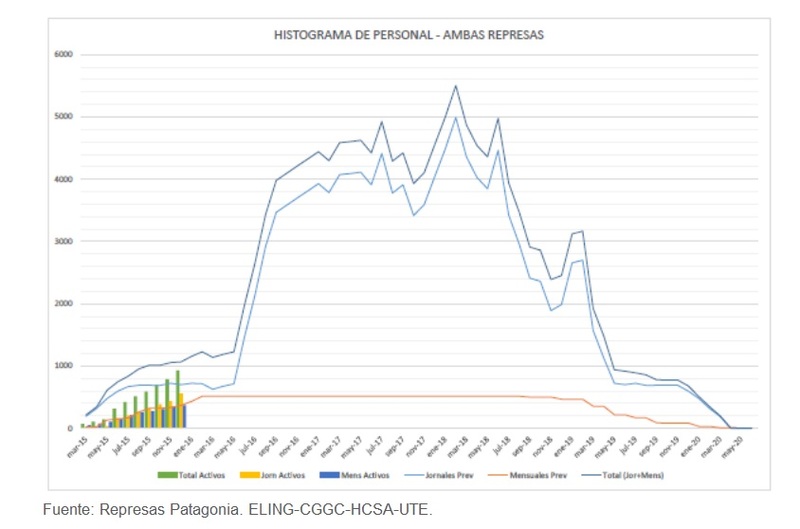 Furthermore, there are sufficiently broad technical studies showing that the level of the dams is disconnected from Lago Argentino Lake and will thus not affect the glaciers. The resolution of the public hearing minutes reads as follows: “…The Environmental Impact Study for the works has been approved…. The community is informed that it is therefore invited to continue supporting this environmental impact assessment.” We invite La Nación newspaper to publish the resolution of the 9 December public hearing. The Bidding Conditions ensure support to the natural water levels of Lago Argentino, thus not affecting the glaciers. The interdisciplinary studies carried out by renowned practitioners and national and international institutions, together with the technical managers of the joint venture, provide assurances in this regard. It must also be borne in mind that the operation of the dams is regulated by the Santa Cruz Province Committee on Basins. Lately, more thorough interdisciplinary studies were carried out by Santa Cruz Province and the Universidad de La Plata. Their inputs showed that changes could be made so that visually there could be a redundant river section, providing greater subjective reassurance as to the fact that the lake will not be affected, while maintaining hydro power generation capabilities. Thus the basic (original) project was modified, diminishing by 2.40 metres the maximum level of operation of the Néstor Kirchner dam, down from 178.90 to 176.50 metres and the maximum level of operation of the Jorge Cepernic dam was increased from 112.2 to 114 metres. These changes were endorsed by the world’s most prestigious experts in designing dams, and guarantee the original generation capabilities, whilst doing away with any doubts about the dams affecting the glaciers. In brief, the decoupling of the Néstor Kirchner dam from Lago Argentino Lake ensures the glaciers will in no way be affected. We absolutely reject the fact that any NGOs of whatever kind, as well as the recent actions by the Executive Branch with regard to the Law on Audiovisual Communication Services –and the intervention of AFSCA and AFTIC- be placed over and above national and provincial laws, their institutions and resolutions. The Argentine right-wing only believes that public hearings are legitimate if their resolutions are aligned with having an atrophied, under-developed Argentina, with subdued provinces. This also applies to criticism targeted to AFSCA K political activists. Only the K group is considered an activist group. 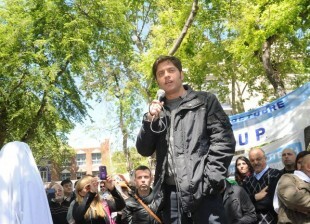 PRO party members, Aguad and Macri’s family members, are not considered activists. In this case they are neutral political servants, with no conflict of interest. Sociedad Rural, Cristiano Rattazzi, Paolo Roca and Juan José Aranguren (whilst he was at Shell and tried to extort us to align fuel prices with international fuel prices, as he will now regretfully achieve, unfortunately for the country’s citizens and consumers). La Nación newspaper only accepts defending legal certainty regarding those business men and women who in the time of K pro-government political forces turned against the party in office and nowadays “adore” the ruling party. The right-wing in Argentina seems to be pulling our leg when it says its concerned about making public investments to improve the well-being of most Argentines. When they ruled Argentina –either forcefully or because they were voted into power- public investments not only boiled down to zero but, furthermore, budgets were outlined in IMF offices. Meanwhile the provinces -cheated and restricted by the Federal Commitment to Growth and Fiscal Discipline of 1999-2000- saw tax collection and local investments drop, while their rights and those of their citizens were impaired. And since we are talking about public investments, we would like to take this opportunity to remind La Nación newspaper of the first few investments of the National government it fought so much to favor: an eight-billion dollar debt with foreign banks which were accomplices in the 2008 financial crisis; depriving the Argentine people of 2 to 3 billion dollars a year (subsidies to the Sociedad Rural, CRA, CARBAP and Agribusiness corporations); opening up of borders to imports; putting at risk over 4 million jobs because of the negative impact on 2 million shops, factories and businesses of the elimination of energy subsidies; dismantling of the Federal Solidarity Fund for Soybean (according to OETEC and based on Ministry of Planning data, in the last five years this Fund delivered resources to all 23 provinces and their municipalities in the amount of 70 billion pesos); and finally, the key factor in all this, destroying the strategic partnership with China and close to 13 billion dollars in investment committed (without including the ongoing 11 billion swap which nowadays supports the devaluation adventure of Macri’s administration). The newspaper questions the unquestionable. During the 15-year term of the project loan –which will be repaid by selling energy from the power plants to CAMMESA – the Argentine Republic will have a positive balance of currency for a total amount of 6.21 billion dollars. From year 15 onwards (9 years after completion of the dams) the project will continue to generate savings by substituting fuel purchases from abroad, once the loan principal and interest have been paid back. Savings through import substitution of fuel (cumulative values) amount to around 10.72 billion dollars. The above, of course, is questioned. And the dams are environmentally questioned. However, there is nothing to question about the very green decision of placing a former Philip Morris official (Eugenio Breard) to head the National Parks Administration, a former Monsanto official (Leonardo Sarquís) to head Agricultural Affairs in Buenos Aires Province, and to head Argentina’s Ministry of Energy, a former Shell man (Juan José Aranguren). We have left to the end, although it was already mentioned in our introduction, what we believe explains the sharp and recurrent attack of La Nación newspaper on the dams. And since we have been speaking about questioning, this is geopolitical questioning. Either by indication of its western allies or because of its bicentennial repudiation to any trade, economic or political equation that is slightly different and moves us away from our destiny as eternal suppliers of grain and cows within the international labour division, imposed from the times of Rivadavia and Canning through to the European Central Bank, IMF and vulture funds, La Nación newspaper has for long now declared war on the strategic partnership we have patiently built with the People’s Republic of China. Indeed, it fights against our national geopolitics on all fronts and with all our non traditional allies. In this regard, we shadow the words of the Observatory’s director: “Argentina, on the path to being something other than an eternal provider of ruminants and chlorophyll, is partnering with a country like China, which is unprecedented in our history and must go beyond what is proposed (mainly by the people themselves) on whether trade conditions (manufactures/raw material) are or not the optimum or most advisable situation. China is guided by its own interests, but it is a power that when the time comes to extend its influx and consolidate its markets, both domestic and external, moves out of the Anglo-Saxon hegemonic expansion pattern (imperialistic). The new Chinese-Argentine partnership will be fruitful and cooperate with the genuine and gradual development of our productive forces if people’s creativity and political decision are, as shown in the recent agreements, up to the needs of our unresolved national issue. The strategic partnership and alliance with China already goes beyond financial and trade aspects: it is useful for shielding social, industrial, scientific, and technological and energy progress and conquests of the last 11 years against privatization and any potential repeal. And it is not a bad idea to shield oneself with foreign partners. Since 1810, domestic enemies of the Argentine people have been ill-treating us thanks to foreign assistance! Guess what: who is upset by the overarching strategic partnership between Argentina and China? China is known to be increasingly entering Latin American markets. Anyhow, the amount of the investment committed here in our country and the works involved (energy, nuclear, ground stations, etc.) is well above what has happened in other countries in the region. 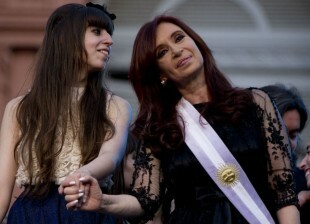 As mentioned above, the Sino-Argentine partnership must come to an end, or at least move away from the track it was on. There has been a 180-degree shift in the Macri administration regional and international politics and geopolitics. The Belgrano Railway Plan and the government’s negotiations with the European Union, with the Pacific Alliance trade bloc and members of the Trans-Pacific Economic Cooperation Agreement aims at the country’s reinsertion in the “world”, once again as raw material suppliers, re-commoditizing our exports. Within this regional and global geopolitical strategy, the country’s President and the President of the Sociedad Rural (farmers’ association) count for nothing. The conductor here is the USA, imposing that the administration in office leads the country back to being a small one, with those olden international relations that damaged our peoples so much, as well as our provinces, the industrial sector, the domestic market, regional economies, our sovereign and people-centred science and technology. La Nación newspaper is a good example of domestic conservatism, criticizing the works which are an icon of the strategic partnership between our country and the Asian world power; it is aware that if one collapses, so will the other. The newspaper cares two hoots about lying, distorting and playing the fool provided it meets the supreme mandate. Electroingeniería and the Chinese are humiliating to our country and harm it. Impregilo was not equally treated with regard to the Yacyretá works. The same goes for Siemens that walked out on us at the Atucha II Nuclear Plant as a result of the German government’s decision of closing down its nuclear programme. When reading La Nación one got the impression that is was more serious to complete the works and start up our third nuclear plant than the unbelievable abandonment of the German company and its legal uncertainty. The problem is China, its Yuan, its investments, its “win-win” approach and the displacement it brought about of US and European companies, industries and financial institutions. Europe and the USA cannot afford to lose South America again. Undermining the main footing, as well as moving China away from the most important partner it has ever had in this part of the world –Bicentennial Argentina- are the objectives of the imperial and neo-colonial strategy at the advent of the 21st century. Represas de Santa Cruz: ¿a quiénes les molesta la alianza Argentina-China?